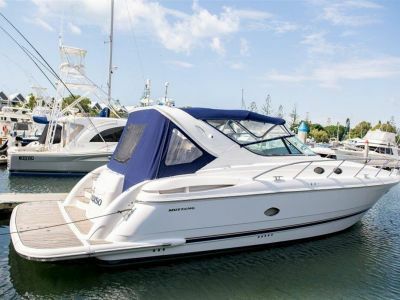 The Riviera 43 Open Flybridge incorporates great function and style within a supremely comfortable, sea-kindly hull. The most striking aspect about Riviera's latest creation is its design approach - a thoroughly modern methodology that will progress flybridge boat design into a new generation of boating enjoyment. Designed exclusively using Riviera's Unigraphics three dimensional CAD software system, the result is a superbly considered boat with abundant use of light and space. 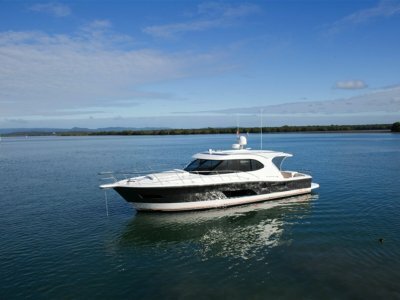 The 43 Open Flybridge brings the outdoors in, creating an al fresco environment with a seamless transition between the expansive cockpit and the contemporary leather and varnished cherry interior. The main saloon is both beautiful and practical, with seating for seven in a U-shape lounge to starboard around a generous sized, timber folding table. To port is the fully equipped galley complete with a breakfast bar for two forward. Below decks there is sleeping accommodation for up to six in two large cabins. The forward master stateroom features a queen sized two metre long double-bed, with a cedar-lined hanging robe, extensive storage and an ensuite bathroom. The aft, full beam cabin has large port lights with optional portholes either side for natural light and cross ventilation. A large skylight under the forward saloon windscreen provides additional light to this cabin, creating a bright and welcoming space. The flybridge, accessible from the cockpit via a new design 'stair-ladder', offers 360 degree vision with minimal interruption, thanks to a new structural hard top canopy. Swivel companion and helm chairs allow fingertip console control while there is seating for four in an L-shape lounge in front of the helm around a weatherproof table. A wet bar with settee opposite on the port side completes the flybridge comforts. The proven Volvo Penta Inboard Performance System (IPS) has allowed Riviera designers to create a fresh accommodation layout on the new 43 Open Flybridge. With all major engineering positioned well aft, enormous gains are made with beam-width space amidships. Twin counter-rotating, three-bladed forward facing propellers drive ahead of the pods in what is turbulence-free water to deliver a powerful yet smooth ride. 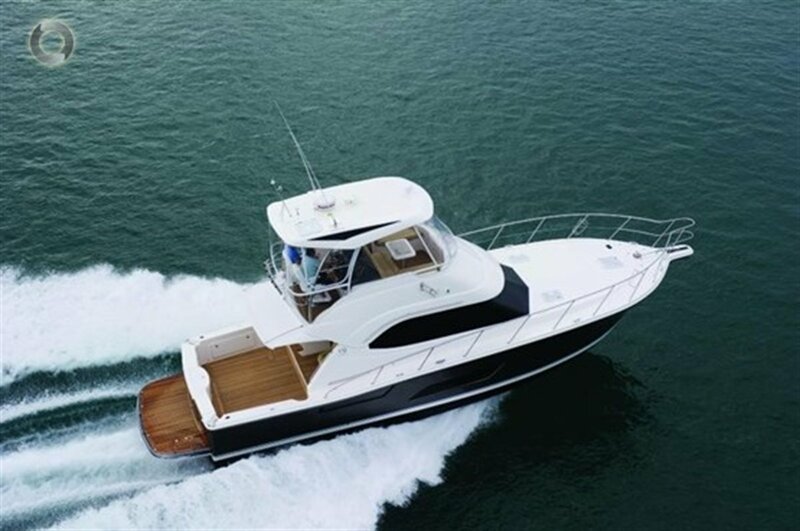 Handling the 43 Open Flybridge in close-quarters is made care-free via the use of the integrated joystick control. The hull and deck construction is solid hand-laid fiberglass below the waterline and core materials in the hull topsides and superstructure. This composite laminate design makes good use of weight where it is needed most, to deliver a solid feel and soft ride offshore.